From Season 3, Episode 2 - The Crystal Empire, Part 2. By popular demand, here's another crystal pony vector. I used a slightly different technique for the crystal effect, so I hope it turned out alright. Feedback would be very appreciated. Additionally, here's a brief outline of how I did the crystal effect. I'll skip the part that I've mentioned previously, where I traced each individual facet of the crystal pattern, because it's unnecessary here. This guide (and the included file) is intended for use with Inkscape. This file (Inkscape SVG) contains the pattern I used (and the stars, on a separate layer). Hide the star layer, select all of the pieces of the crystal pattern, and group them together as one object (Object->Group, or Ctrl+G). Copy that object, and then paste it into your own vector on a new layer above your pony. You'll probably want to paste several copies onto that layer and arrange them so that they cover your vector in the way that you want, then select all of the copies of the crystal pattern and group them again (Ctrl+G). Note that at this point the crystal pattern will extend off the edge of your vector. To fix this, hide the crystal layer and select all of the pieces of your pony vector (be careful you don't grab anything else, like pieces of the crystal pattern or background elements). Copy them, paste them in place into a new layer, and then group them together. Move this layer above the crystal pattern layer, and then select your merged pony vector and the merged crystal pattern vector, then go to Object->Clip->Set. The merged copy of your pony vector should disappear, and the crystal vector should now cover only the area that your pony vector does. If anyone has any questions (I wrote this pretty quickly and largely from memory, so consider this a rough draft pending further editing). Updated 12/02/12: Adjusted color scheme to make it less dull. She's beautiful! Just like a snowflake. Me (Butterscotch Ripple): "I WAS THERE!!!! FINALLY, I DON'T MISS SOMETHING IMPORTANT!!!! I MEAN, I MISSED THE WHOLE CHAOS THING BECAUSE I WAS ASLEEP, I MISSED THE CHANGELING INVASION BECAUSE I WAS IN THE BATHROOM, I ALSO MISSED THE THING ABOUT PONYVILLE BEING TRAPPED UNDER A DOME!!!!!!!!!!!!" Cool! It looks great! Thank you for letting me know, and thanks for the credit. I used Inkscape. I gave a brief outline in this Deviation's description of how I did the crystal effect, but the shorter answer to how I created the crystal pattern is: Each "facet" of the pattern is a separate vector object with low opacity and a gradient fill of either black or white that is slightly more transparent towards one side of the object. This is more evident in my Crystal Twilight Sparkle vector, because the crystal pattern shows up better against her purple coat. Excelente trabajo, me encanto, y felicito a los animadores que se lucieron diseñando ponys de cristal. Fresco y original, como haces ese efecto? usas mascara? Can I use this? But change the cutie mark? I wanted to try something out. Yep, you're welcome to modify it however you like. If you need any help, let me know. Okay! Thank you so much! I just love the crystal texture. Thank you. It took a ridiculous amount of time to get it right on my Crystal Twilight vector; I spent the better part of the day the episode aired fiddling with it. Thankfully, it proved easier on my subsequent crystal vectors, mostly because I was able to reuse a lot of the work. Worth the effort, though, as they seem to be my most popular vectors by a pretty wide margin. Cool, very nice composition. Thanks for the credit, on this and on the Twilight one. this is really lovely, i really love the idea here, and Fluttershy looks really cute, great job, i love it! Creating the effect from scratch isn't too complicated, just time consuming. Lots of messing about with the path tools (mostly Difference) to make sure that each facet of the effect fits in with the others without overlapping. Hope this guide is still somewhat helpful. Yeah, I'm having a tricky time figuring out how to get the shapes to look right. But the guide definitely helped a lot! If you don't mind,how i can download SVG files? Click the link at the top of the description (or right here: [link]), then find the "Download File" link on the right side of the Stash page and right click on it and click "Save Link As..." (or some variation of that, depending on which browser you're using. It's an Inkscape SVG, so you might have issues trying to open it with any other program. I can't see the pattern. The title should be "The Embodiment of Cuteness"
it's just awesome and beautiful, great work! Having a bit of trouble of clipping the crystal layer in Illustrator. Is this method only usable in Inkscape? I'm not really familiar with Illustrator, unfortunately. I'm willing to bet that there's a way to make this work, but I have no idea how. I sorta got it to work. I can totally use another shape to do the cut thing with the crystal pattern. It doesn't work right when im using your Fluttershy Vector though. She looks so much better like this! I was wondering if I could use this as a base/reference for the hair shape. 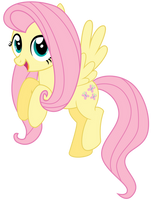 Fluttershy as a crystal pony is a lot like my oc. I'd appreciate it a lot! Just wondering cause I'd be editing your work. I'd still credit you of course and I'd put time into it! If it would ever get done, I'm still a novice at paint tool sai. I can spend 5 hours on something and screw it all up so..
Go ahead! I'd love to see what you do with it when you're done. as if she wasn't beautiful already, they made MORE beautiful!